I bought this guitar as I wanted to add a vintage Selmer styled guitar to my arsenal but did not wish to be a care taker to an original Selmer. Michael suggested the Dupont VRB. I have played quite a few Duponts and have owned a MD-50 which was quite nice but not as vintage “Selmerish” as I was looking for, so I was a bit skeptical if a new Dupont VRB could be what I wanted. As far as playability the neck is 100% Dupont so you don’t get a vintage feeling neck but in it’s place a highly playable modern one. That said the guitar may be the best GJ guitar I have played on quite a few levels. It speaks beautifully and sounds even on every note while sounding vintage if I approach the instrument with that mindset. I was thinking of giving it 4 stars on value but it is such a fine instrument I could not find it in me to lower it’s score. The guitar is very dry as many Duponts are, and the leads cut beautifully with a snarl to them if you want that, or just sing if you don’t attack it too hard. I’m not a detail in workmanship kind of guy, it is secondary to playability and sound, but this guitar is beautiful to look at besides play. Initially I thought very nice guitar pretty expensive, but the more time i spend and play by myself, with others players and my band the Idiomatiques, the better the perception of this guitar is to me. Today before writing this review and playing the VRB it felt like a bargain. This is a great guitar. In a world of many Selmer-style guitars, the Dupont Vieille Reserve Brazilian stands out as one of a handful of outstanding instruments. The attention to detail is, as one would expect, perfect. The main thing is the tone: it's loud without being brash, sweet but assertive when need be, and very well balanced. Each note sounds clearly without any dead or over-responsive notes. The neck and fingerboard are perfect and it's set up very well. In a nutshell, this guitar holds its own with any of the other top instruments, including an original Selmer. This Dupont VRB is one of the best Selmer made guitars i have ever played and other than an original Selmer it would seriously rival any gypsy guitar out there. It is extremely resonant with warm mids and sparkling lead notes necessary for those lyrical arpeggios.The action is smooth and effortless. Michael was very helpful with his expertise and acurate description and answered all of my questions about the guitar. 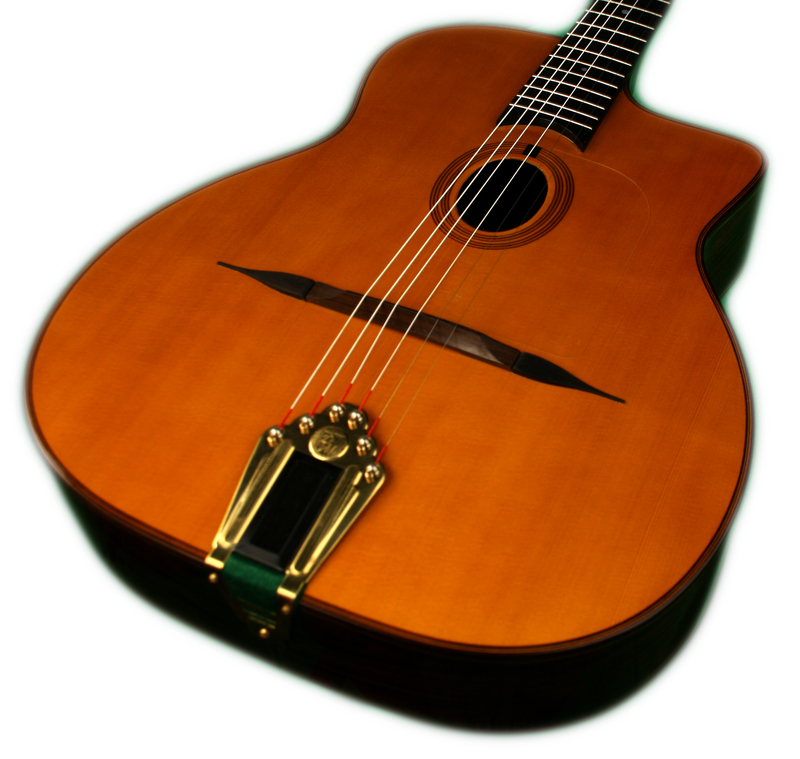 I would highly recommend Djangobooks as a fantastic music source to anyone looking to purchase a gypsy guitar from the best price selection Michael has in his inventory.